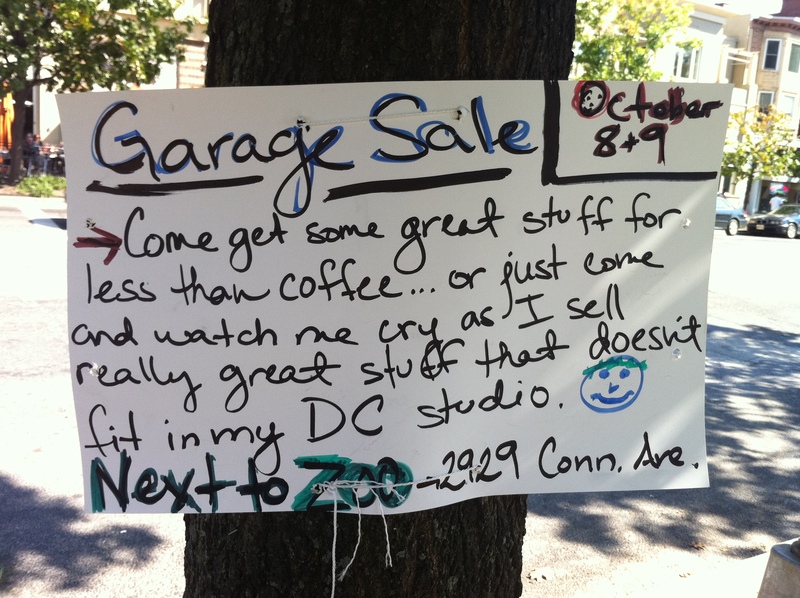 Come get some great stuff for less than coffee… or just come and watch me cry as I sell really great stuff that doesn’t fit in my DC studio. I’ve been there, sort of. I made the mistake a while back of having more space–in an apartment in Alexandria, VA–and thinking I needed to fill it with more stuff, then moving from there back to DC-sized apartments was a wake up call. And I’m a pack rat, I don’t deny it. I never went through the hassle of a yard sale, but Freecycle was very good to me, because while people coming to a yard/garage sale might want your stuff, Freecycle followers definitely want it and will come almost immediately to get it. I gave away a microwave oven within an hour–and had over 15 requests for it! Next story video: …in your own home. Previous story video: …Man Reminder? I do feel kinda guilty when I walk by people’s beloved stuff and have that “Yeah, no.” look on my face.